A steaming hot bowl of chili on a cold winter day? Or to watch the Super Bowl? Yumm! This is not your everyday chili. Chipotle chiles in adobo sauce and Angostura bitters add a smoky-bitter depth that is just plain delicious. Make the chili a day or two ahead and refrigerate — the flavor keeps getting better. Heat oil in an 8-quart pot. Add onion, garlic and ground beef. Cook over high heat, stirring occasionally, until beef is crumbled and is no longer pink, about 10 minutes. Meanwhile, in a large bowl* combine remaining ingredients except beans and salt. Use an immersion blender to puree, or place in blender container in two batches. Mixture does not have to be smooth, just smooth enough so the chipotle chiles are not chunky and are distributed throughout mixture. Stir into cooked beef. Add black beans to chili and bring to a boil. Reduce heat, cover and simmer 20 minutes stirring occasionally. Uncover and cook 25 – 30 minutes more. Add salt to taste. Top individual servings with shredded cheese, sliced green onion, sliced avocado, dollops of sour cream or Greek-style yogurt, or crunchy tortilla chips. If you’d rather not puree these ingredients, just make sure the chipotle chiles–with some adobo sauce–are finely chopped or macerated. Add to beef along with all remaining ingredients. 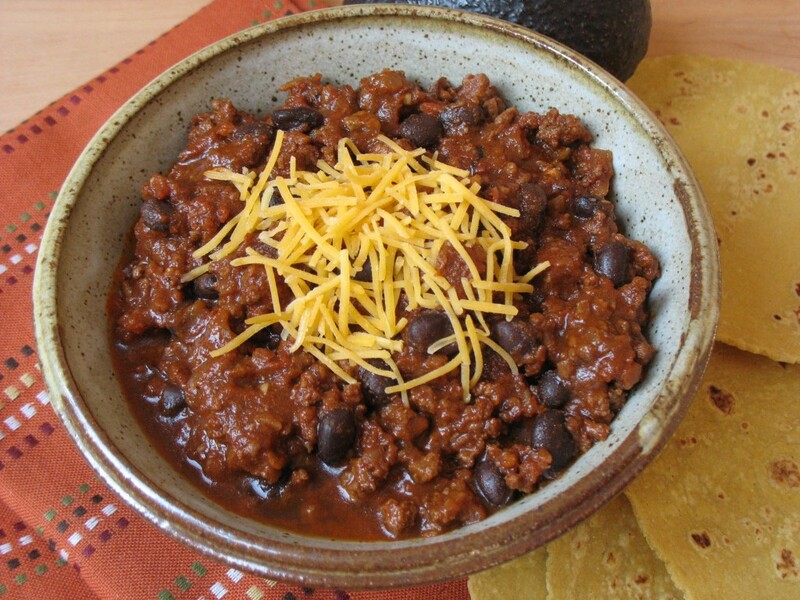 Use 3 chipotle chiles if you like chili on the spicy side. Remaining chiles may be frozen for future use. Pack them in twos in plastic wrap, then into a freezer bag. Recipe may be halved; use a 6-quart pot. You had me at chipotle! Funny story–my mom famously made a pot of chili once, using a recipe that called for 2 canned chipotle chiles, as yours does. Not understanding the instruction and being unfamiliar with chipotles–in her defense, it was a bunch of years ago, when most of us were unfamiliar with chipotles–she used 2 whole cans. Mouths were on fire that night! Great story! We could write books about our mothers and cooking. A long time ago, I made tuna casseroles for company. We sat down to dinner, and there was no tuna in it! Walked to the kitchen, and there were six cans of open tuna on the counter. That stuff always happens when company’s coming, doesn’t it? Funny.